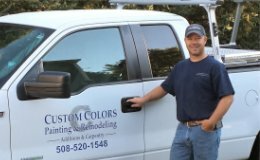 CUSTOM COLORS Painting and Remodeling, Inc. is committed to first-rate service and quality workmanship. Our success is based on repeat business and referrals. We take pride in our attention to detail, professionalism, and client-customer relationships. Our craftsmanship on finish work, cabinets and all projects, large or small, is custom and top quality. Our talented painters will respect your home and complete the project to your satisfaction in a timely manner. CUSTOM COLORS Painting and Remodeling, Inc. focuses on quality work and satisfied customers. Your project is important to us! Are you considering adding an attached garage to your existing house? How about a second or third floor, or maybe even a new home? Or perhaps you are considering simply updating and redesigning your interior floor layout to make better use of the existing space? Whatever the size or scope of the job please give us a call. We take pride in our attention to detail, professionalism, and client-customer relationships.